‘We were never born to read’, says Maryanne Wolf. ‘No specific genes ever dictated reading’s development. Human beings invented reading only a few thousand years ago. 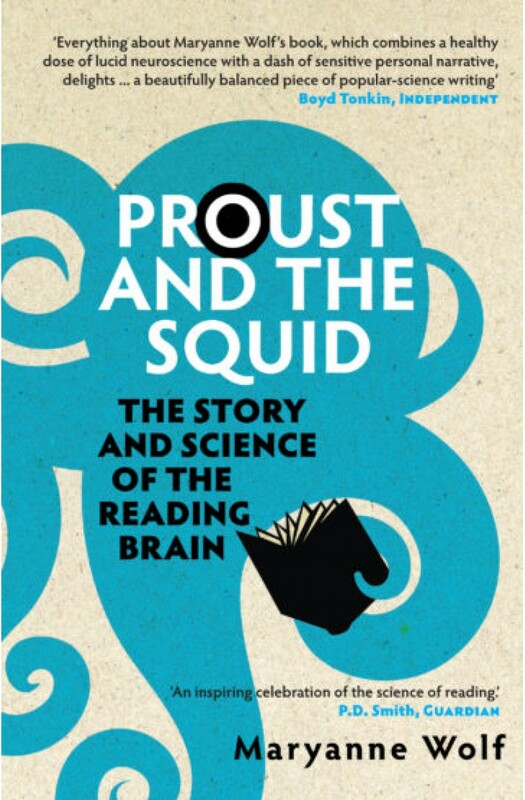 And with this invention, we changed the very organisation of our brain, which in turn expanded the ways we were able to think, which altered the intellectual evolution of our species.’ In “Proust and the Squid”, Maryanne Wolf explores our brains’ near-miraculous ability to arrange and re-arrange themselves in response to external circumstances. She examines how this ‘open architecture’, the elasticity of our brains, helps and hinders humans in their attempts to learn to read, and to process the written language. She also investigates what happens to people whose brains make it difficult to acquire these skills, such as those with dyslexia.Wolf, a world expert on the reading brain, brings both a personal passion and deft style to this, the story of the reading brain. It is a pop science masterpiece on a subject that anyone who loves reading will be sure to find fascinating. ‘Everything about her book, which combines a healthy dose of lucid neuroscience with a dash of sensitive personal narrative, delights … a beautifully balanced piece of popular-science writing’Boyd Tonkin, Independent.